Cult Germanium Channel is an expanded version of the one-knob Cult Germanium Overdrive. Guitar Player magazine calls Cult “The most dynamic overdrive we’ve heard.” Vintage Guitar declared it “one of the most flexible fuzz units we have ever tested.” Tone Report says, “Cult’s dynamic range is freaking ridiculous.” Users include Richard Fortus of Guns N’ Roses, Pharrell Williams’s Brent Paschke, and Paul McCartney’s Brian Ray. 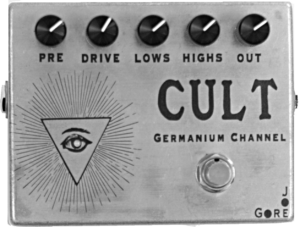 Cult Germanium Channel’s added controls shape tones before and after the drive circuit. Variable input capacitance yields everything from bright ’60s-style treble boosting to Sabbath-like sludge. Immaculately tuned 2-band active EQ helps you dial in the perfect emphasis. The EQ is fastidiously tuned for good, usable sounds at every possible setting. Caution: Both Cult pedals behave differently than most overdrives, 90% of which are related to a pedal whose name rhymes with “Lube Creamer.” Cults are vastly more dynamic, with explosive impact and no nasal midrange hump. But while “Creamer” overdrives sound fairly similar regardless of output setting, Cult pedals need to whack your amp hard for the best effect. Germanium transistors are also a bit noisier than the op amp chips in most overdrives. Consider these tradeoffs before proceeding. Here’s another demo from a guitarist with a very different style. Nashville session bigwig Kenny Greenberg recorded this clip a single Cult Germanium Channel setting (PRE at about 4 o’clock, all other knobs near 2 o’clock), just to see how many tone variations he could create without touching the knobs. Thanks, Kenny, for recording this and letting me share it. •PRE shapes your tone at the input. With the knob fully right, you get the fat, full-frequency sound of the one-knob Cult pedal. Rotating the other way filters the signal — it gets progressively cleaner and brighter. (You can think of PRE as a “fat vs. crisp control.”) The PRE and DRIVE controls are extremely interactive. • DRIVE cranks up the gain. It’s scaled for cool sounds throughout its entire range (unlike ’60s booster clones, which sound best cranked.) DRIVE and PRE are highly interactive. • LOWS and HIGHS control an active EQ stage. (Such circuits never appeared on ’60s pedals.) The knobs provide usable tones in all possible positions. • TRIM is simply a master volume control.